How much does PS TV cost? When does it come out? The PS TV system will retail for €99.99/£84.99 RRP when it debuts on 14th November, across PAL regions. PS TV across PAL will come with a digital download voucher for three PS Vita games – Worms Revolution Extreme, Velocity Ultra and OlliOlli. When does PS TV come out in the SCEE region? What comes in the PS TV box at launch? PlayStation TV system, HDMI cable, AC adaptor, AC power cord, printed materials, digital download voucher for three games – Worms Revolution Extreme, Velocity Ultra and OlliOlli. HDMI OUT, Ethernet, and one USB 2.0 port. PS TV also features integrated 802.11 b/g/n (n=1×1) Wi-Fi for wireless internet connectivity and for DUALSHOCK 3 and DUALSHOCK 4 controller support as well as Bluetooth headset/headphone (A2DP, AVRCP, HSP) and keyboard (HID). PS TV has 1GB internal memory, which can be used for game saves or small-sized downloadable content. You will need a separate memory card for those games that require game saves or have downloadable content with larger data. What are PS TV’s physical dimensions? PS TV measures approximately 13.6 mm (thickness) × 105 mm (height) × 65 mm (length). 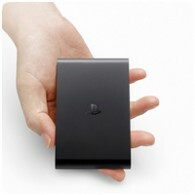 PS TV weighs approximately 110 grams (0.24 pounds). What is the difference between PS TV and the PS Vita? The following table highlights the feature differences between the two Remote Play systems. • Photos cannot be taken on PS TV’s [photo] app (PS TV does not have a camera). • When using voice chat on PS TV’s [party] app, users must use a separately sold Bluetooth headset (PS TV does not have a microphone). Network Connection PS TV supports both Wi-Fi and Ethernet. Video/Sound Output PS TV outputs video/sound to a TV via HDMI cable. Controls PS TV is controlled by DUALSHOCK 3 or DUALSHOCK 4. The touch pointer feature allows users to use right/left stick on a controller (DS3 or DS4) to perform touch operations like you would on a PS Vita system. In addition, users can also use a touch pad on a DS4 to perform touch operations. Users can use this feature in supported PS Vita titles or PS Mobile titles*. (Reference 1) – Online users guide for the touch pointer feature here. (Reference 2) – [OPTIONS] and [SHARE] buttons on a DS4 will be assigned to [START] and [SELECT] button on a PS Vita system. (Reference 3) – Speaker and Stereo headset jack on a DS4 are not supported on PS TV. PS TV supports key input via Bluetooth keyboards (however, Sony Computer Entertainment does not guarantee compatibility with all Bluetooth keyboards). Game Titles PS TV supports different titles from PS Vita. The model colour at launch is black. PS TV will support 480p, 720p, and 1080i via HDMI output. PS TV will output PS4 Remote Play content in HD at 720p. Will PS TV support 4K content for video or gaming? No, the PS TV system does not support 4K output for games. Does PS TV support analog video or audio output? Does PS TV support standard-definition TVs? No. PS TV’s video and audio are transmitted using HDMI, a common digital connector found on most HD TVs. PS TV does not support standard-definition TVs. Will PS TV require a system software update at launch? How will system updates work post-launch? Upon launch, PS TV will require a system software update to add several new features. After you connect to the internet, you will need to sign into PSN, where you will receive a notification to update the system software. Which PS TV features will be available at launch? Features already available on PS Vita, such as Party and PS4 Remote Play will be available when PS TV launches. Additional PS TV features will be rolled out in phases — please read full details on what’s available following system software update 3.30, and follow PlayStation Blog and PlayStation.com for further news. Every game features a space called “LiveArea” where you can access new game information from Sony Computer Entertainment and third-party developers and publishers via PSN. You’ll also be able to view an “Activity” log that includes your PSN Friends. This log is constantly updated with accomplishments from users who are playing the same game, which in turn can trigger active real-time communication and gameplay among users. Does PS TV offer sub-accounts? How do they work? Yes. Click here for details and instructions about using sub-accounts. Does PS TV offer parental control options to restrict content to younger users? Yes. With PS TV, users can set the system’s control level for playing a game, video, or application, as well as for using the internet browser and PlayStation Store. Play duration can also be set by minutes/hours in 15-minute increments for each day of the week. Also, for each sub-account user, there are controls over the ability to use chat features, the ability to post and view user-generated media, and the ability to control a monthly spending limit for PlayStation Store purchases. How many SEN accounts can be connected to PS TV? As with PS Vita, only one SEN account can be connected to PS TV at once. Is there a limit to how many PS TV’s I can activate on my SEN account? You can activate up to three PS Vita or PS TV devices. For example you could activate 2 x PS Vita and 1 x PS TV, or any combo of the above. If I have purchased PS VITA from Japan or PS TV from North America, can I use my European SEN account? From a customer services and compatibility point of view, we recommend that you purchase PS TV in the country you are based. Can I block or unblock another user on PS TV? You can add users on the PSN with whom you do not want to communicate to your block list. Messages from people on the block list will not be received. Also, people on the block list will not be able to see your activities and friends list. You can also remove someone from your block list. Will PS TV support media servers or DLNA support in order to stream videos or movies from a home PC? The Network Media Player (coming soon to PS TV and PS Vita) can be used to access media servers over a network. The Network Media Player can be used to view photos and stream music and videos from a media server located on your home network. You can also copy photos, music and video files from the media server to your system. When will PlayStation Now launch on PlayStation TV? PlayStation Now is not yet available in the PAL region. Further details will be confirmed at a later date. What PS TV games will be available at launch across PAL? There will be hundreds of games supported at launch. You can check this url for the official list: eu.playstation.com/pstv. PS TV can play games from a range of PlayStation platforms, including compatible titles from PS Vita, PSP (PlayStation Portable), PS One Classics, and PlayStation Minis.. As with PS Vita, PS TV supports PS4 Remote Play, allowing PS4 users to continue playing a game on a PS TV system in another room such as their bedroom. Customers can purchase supported PS Vita games at retailers, or purchase and download games from PlayStation Store to PS TV’s memory card. Customers can also purchase digital games through the Sony Entertainment Network online store via their PC. Will any PlayStation Store content purchased on PS Vita system be transferable to a PS TV system? All PS Vita titles that are PS TV compatible will be available on the platform. For example, a selection of popular digital titles including Hotline Miami, Spelunky, and Sound Shapes will be available to purchase on PS TV after launch. Gamers who purchased these titles for the PS Vita systems will be able to download the PS TV versions of these titles, some of which feature enhanced graphics or improved features, to their PS TV systems for no additional charge if they are using the same SEN account. Can PS TV and PS Vita users play together online? This functionality is technically possible and some developers may choose to support it for their titles. Why are there differences between the regional compatible games lists? While Sony Computer Entertainment is a global organisation, as a business we take every measure to provide for the local requirements of individual markets. As such there may be variations between game lists in different regions. Gamecard and downloadable versions of games are not region locked. However, we would like customers to buy games which are sold in your country from a customer service and guarantee point of view. Also, there is a possibility that some of third party games may be region locked. What accessories will be available at launch for PS TV? Standalone Memory Cards will be available at launch, providing plenty of options for storing games and saving data, videos, music, photos, and more. Additional DUALSHOCK 3 and DUALSHOCK 4 Wireless Controllers can also be purchased and used with PS TV. Can I use my PS Vita memory card with PS TV or do I need to purchase a separate memory card? You can use the same memory card if you have the same SEN account on your PS TV as on your PS Vita. Will the Wireless Stereo Headset 2.0 and PULSE Wireless Stereo Headset work on PS TV at launch? What about other wireless headsets? PS TV will not support the Wireless Stereo Headset 2.0, Pulse Wireless Stereo Headset or the original Wireless Stero Headset. PS TV generally supports Bluetooth headsets, speakers, and keyboards. Can I use my PS3 remote control on PS TV? Yes, PS TV supports BD remote control (CECH-ZRC1). Does PS TV support the PlayStation Move motion controller? Does PS TV support external HDMI-based game capture devices? PS TV supports HDCP (copy protection). HDCP cannot be turned off. How can users charge DUALSHOCK 3 or DUALSHOCK 4 controllers? Does PS TV include a charge cable? Users can charge the DUALSHOCK 4 controller on PS TV using the USB micro charge cable (included with PS4 and available for purchase separately. The DUALSHOCK 3 controller can be charged using a USB mini-B cable (available for purchase separately). Dedicated charging stations for both DUALSHOCK 3 and DUALSHOCK 4 are also available. How do the “Share” and “Option” buttons work on the DUALSHOCK 4 controller when used on PS TV? The “Share” button on the DUALSHOCK 4 operates like the “Select” button on the DUALSHOCK 3; the “Option” button on the DUALSHOCK 4 functions like the “Start” button on the DUALSHOCK 3. The DUALSHOCK 4 controller will work as normal when using PS4 Remote Play. Is it possible to charge a DUALSHOCK 3 or DUALSHOCK 4 controller via my PS TV when I’m not playing? Yes, you can charge DUALSHOCK 3 or DUALSHOCK 4 wireless controllers when PS TV is in standby mode. PS TV supports up to four DUALSHOCK 3 and DUALSHOCK 4 wireless controllers for local multiplayer experiences. A maximum of two controllers can be used during PS4 Remote Play. The number of controllers that are supported will depend on individual titles/applications. Can PS TV and PS4 users voice chat together? PS TV and PS4 users will be able to communicate with each other via text messages and voice chat using the Party app and a supported Bluetooth headset. For cross-game Party Chat, how many players will PS TV support? As with the PS Vita system, PS TV will support up to eight users for cross-game Party Chat. The Party Chat feature works across PS TV, PS4, and PS Vita platforms. PS4 Remote Play will enable users to stream their PS4 gameplay to their PS TV system via the network, freeing up the main television in the home for other uses. Sony Computer Entertainment expects that most PS4 titles will support Remote Play unless the title requires a special peripheral such as PlayStation Camera during gameplay. Furthermore, Blu-Ray Disc titles and DVDs cannot be played, and content from some video services cannot be played either. When will PS4 Remote Play work best? For the best PS4 Remote Play experience, set up a wired connection to your home network. This will give you the fastest and most stable connection. If you’d like to play wirelessly, make sure there is a strong signal on your home network. A wireless connection will work best when the PS TV system is located within close proximity to a Wi-Fi AP (access point) where the PS4 system is connected. How will Cross Play function between PS4 and PS TV systems? Supported titles will allow the PS4 system and PS TV users to play together in the same game via online multiplayer (PlayStation Plus required for online multiplayer on PS4). Are there any other cross-functional capabilities between PS TV and PS4 users? Players can voice chat or text chat between the PS4 and PS TV systems using the Party application, even during gameplay. Users can also browse and compare each other’s Trophies. Text messages can also be sent/received between PS TV and the PS Vita and PS4 systems. Can I play different games at the same time on PS4 and PS TV during PS4 Remote Play? No. The content shown on PS TV during PS4 Remote Play will match the content shown on the PS4 that you are connected to. Can two people use my account’s content on two different PS TV systems at once? Video content such as movies and TV episodes available on PlayStation Store will be available at launch (services vary by country). Check PlayStation.Blog and PlayStation social channels for further news and updates. Will high definition movie and TV episode content for PS TV be available to purchase from the PS Store? No. Movie and TV episode content available from PS Store for PS TV is standard definition only at this time. What features will be available with PlayStation Plus on PS TV? Monthly Games™ – Access to a regular, curated selection of titles made exclusively available to PlayStation Plus members at no additional cost. Discounts – Members will have access to exclusive discounts on PlayStation Store. Online Game Save – Members may automatically (or manually) upload game save files to Online Game Save Storage for safekeeping. Up to 1GB of cloud storage will be allocated to your PS TV save files. Other benefits – Early access to exclusive game content, automatic game patch downloads and installation, and more. Is PlayStation Plus necessary for multiplayer gameplay on PS TV? Does my Plus membership for PS4, PS3, or PS Vita systems still count for PS TV? Yes. One PS Plus membership will continue to grant benefits for your PS4, PS3, and PS Vita system, even after you pick up a PS TV. How does PlayStation Plus membership compare on PS4, PS3, PS TV, and PS Vita systems? What network services will be free on PS TV, without a PlayStation Plus membership? Will I be able to play MP3s on PS TV? Yes. PS TV can play MP3 music that is stored on the memory card.